FTAC-76. 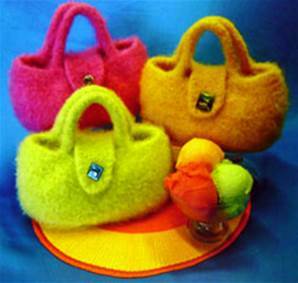 Stylish bags in ice cream colours use a strand each of DK and of mohair yarn. 12-13 ins long by 7-8ins deep. 11sts to 10cm, 8mm needles. Requires 210 yds each of a mohair and wool. 11sts=4ins(10cm). 8mm circular needles and 8mm dpn.